The most recent sample-sized products I've been putting to the test have been all about luxury skincare with Caudalie and Aurelia Probiotic Skincare. This product is simply gorgeous! It's a very light, milky serum that is absorbed into the skin instantly with no residue whatsoever. It's really soothing and hydrating, leaving the skin with a dewy and radiant glow. I've been using this before moisturising but it can also be used alone. You literally only need two little drops of this serum per application so I expect this sample will last for a while yet, but when it runs out I am definitely thinking of getting this in full size! I've been using this after the Aurelia serum at nighttime - these two products work very well together. This is a luxuriously rich, thick cream with a delicate, relaxing scent. It really is a pleasure to massage into the face, neck and décolletage before bed. After such a wonderful first impression of this brand, I'd love to try out the day moisturiser and cleanser from Aurelia next. I have a few little tubes of this that came free with my last purchase of Caudalie's Beauty Elixir. This is a really lightweight eye cream which I've been finding super refreshing and moisturising. It's also great if you have sensitive eyes like me. My search for the perfect eye cream doesn't end here though unfortunately as I'm looking for something that will specifically help with my dark under-eye circles - do let me know if you have any recommendations! I must admit I wasn't crazy about this body oil, mostly because it's quite strongly perfumed (with synthetic fragrance from what I can gather). I've mentioned before on this blog that I'm not a fan of strong scents so I'd have to really love a product to make an exception. Smells aside, it does have a lovely feel and I have heard a lot of love for this product elsewhere in the blogosphere, so if you like your beauty products scented then you might enjoy this oil! The serum sounds very good, not a brand I can say I've heard a lot about! 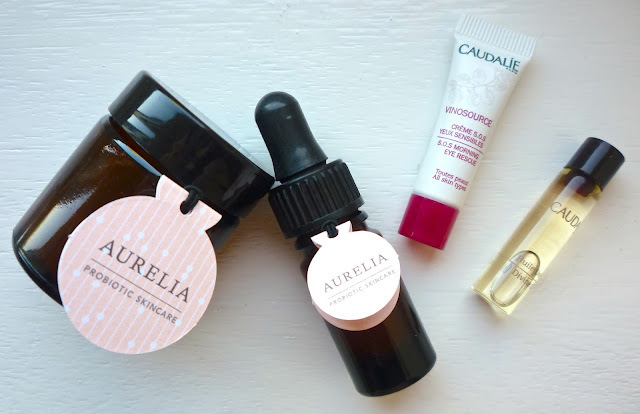 I have the Aurelia Revitalise & Glow Serum and think it's just beautiful! Definitely the best milky consistency serum I have ever tried. I'm dying to try both the day and night creams from Aurelia though. I'm not a fan of body oils in general. I prefer to stick to scrubs and lotions!